Favorite food: I am VERY picky...so it must be tuna. Favorite toy: Balls that squeek. 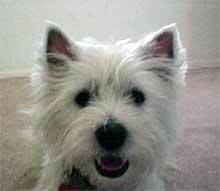 Favorite activity: Getting out of the house with my Westie brother Rocky and going to someone else's house. Special talents: I am the quickest dog on my feet that my Mom has ever seen. Most embarrassing moment: OH! I still tinkle when I meet new people! Most trouble I ever got into: Getting lost for 2 hours...but actually it was my brother Rocky's fault. My favorite friends: Rocky (I think) my sister Bethie, and my Dad Matt. Biggest adventure: When I went to Colorado in the car.